After all the official Fordham commencement ceremonies had been completed, a very special graduation event took place on the stage of the David Koch Theater at Lincoln Center for the Performing Arts on May 26. A group of six dancers from the New York City Ballet received their diplomas from Anthony Davidson, Ph.D., dean of the School of Professional and Continuing Studies. While five of the dancers had actually attended the Rose Hill ceremonies on May 19, there was no way of telling beforehand whether they could make it. Such is the life of a dancer. Like doctors, they’re on call. They never know when they may be required to step into a role at last minute. To be sure that their years of hard work would indeed be recognized, the dancers organized their own ceremony just in case. Indeed, one of the dancers, Ashley Laracey, was not able to make it up to the Bronx because she was performing that day in Jerome Robbins’ Antique Epigraphs. Nevertheless, Laracey was able to celebrate with fellow dancers Abi Stafford, Emily Kikta, Cameron Dieck, Marika Anderson, and Claire Kretzschmar. Just like Fordham’s other distinct diploma ceremonies following the main University commencement, the New York City Ballet event recognized the unique nature of these graduates’ experience. Most of these dancers can only take one course per semester. Between rehearsals and performances, it can take them upwards of eight years to get their diploma. A dancer’s career is limited; retirement comes young. And for dancers at the level of the New York City Ballet, one of the premier ballet companies in the world, most have been devoted to their craft since childhood. Preparing for a life after dance was once an afterthought. But increasingly the culture of the University has flowed across 62nd Street to the backstage of the ballet. For many years, dancers at the New York City Ballet have found an academic home at The School of Professional and Continuing Studies, where deans and professors strive to work with the dancers’ schedules and keep them on track. Davidson spoke of how their Fordham education blended with their roles at the top of the dance world. In in her “honorary valedictorian” address, Anderson also spoke of the blended learning. 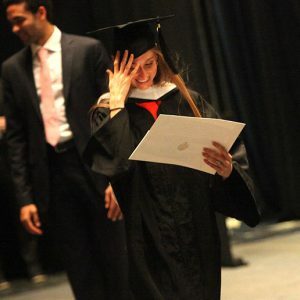 Soloist dancer Ashley Laracey, who missed the Rose Hill ceremony because she was performing, receives her long-awaited diploma. Anderson said that dancers’ natural determination helps when facing the long haul of studying while performing. The twelve years it took her to complete her degree involved tests, papers, and readings alongside rehearsals and performing. But she said it paid off. “Focusing on a path towards organizational leadership and business administration has developed not only the way in which I communicate with people, but it has also taught me to look at the world with open, compassionate, and fearless eyes,” she said. As a teacher at the School of the American Ballet, Anderson said she got to put those skills to use. “For those of you in the audience currently attending Fordham, or when just working towards a goal, the road may seem long, but don’t worry, you will get there,” she said to an audience of family members, friends, and fellow dancers. Indeed, the journey is very, very long, said Dieck, in his address as “honorary student body president.” The economics major recalled studying with ice packs all over his body and trips to the library after Sunday performances in a pursuit that felt as though it “went on forever and ever.” He retired from dance exactly one week after receiving his diploma. He said that he will miss his colleagues, but he is also looking forward to the future as an analyst at the investment bank at Credit Suisse. 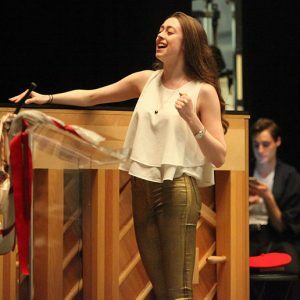 PCS student and corps member of NYCB Meaghan Dutton-O’Hara sings for the graduates. He said that Kretzschmar, who majored in communication and media studies, mentioned to him that she used lessons from her philosophy class to approach a role she was learning or an individual performance that she was giving. “So, as you can see, you learn so much from your education that you can bring into the studio,” he said. As commencement speaker, fellow dancer Silas Mark Farley traced the relationship between Jesuit education and the ballet. He said the “path of formation of New York City Ballet dancers at Fordham is the modern manifestation of a connection between Jesuit education and the art of ballet that stretches back to the 17th century.” At Lycée Louis-le-Grand, sometimes called “the Jesuit College of Paris,” ballet figured prominently, he said. Louis XIV attended ballet performances presented by the students. In concluding the program, Jonathan Stafford, PCS ’16, a ballet master and former principal dancer with the company, thanked PCS Dean Davidson and Associate Dean Cira Vernazza, as well as the Fordham professors and staff. He also credited scholarships from Dance On, a fund that support dancers interested in pursuing a college degree while dancing with the company. Cameron Dieck, Marika Anderson, and Claire Kretzschmar celebrate. 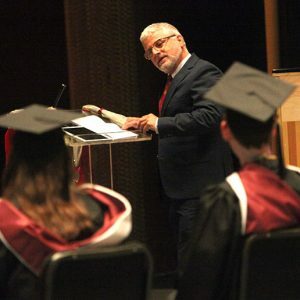 “I sincerely believe that I would not be here standing in this role today if it wasn’t for my experience that I had with Fordham for seven and a half years, working and earning a college degree,” he said. He said that while dancers remain focused on the physical aspect of their work, the often don’t get enough credit for their intellect. Principal dancer and history major Abi Stafford performed while raising her son and attending PCS. She will be heading to law school part-time in the fall and will continue to dance with the company.